It is a quick, sweet victory for the new president, and potentially a historic one. The question now is whether the $789 billion economic stimulus plan agreed to by Congressional leaders on Wednesday is the opening act for a more ambitious domestic agenda from President Obama or a harbinger of reduced expectations. 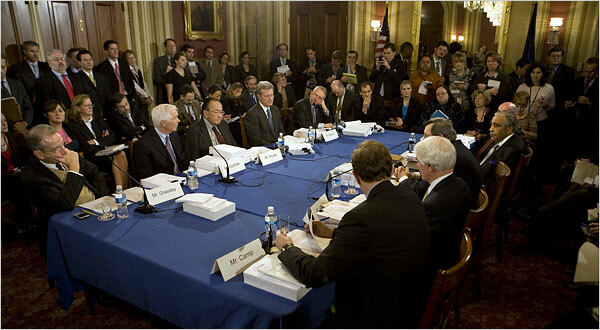 Members of the House and the Senate working on the final version of the stimulus on Wednesday. The fragile consensus, and the president’s agenda, face many tests in coming months. Photo: Stephen Crowley/The New York Times. You are currently browsing the archives for the rebalancing category.